After years of development work and testing, Vancouver-based car connectivity startup Mojio has finally launched its first commercial in-vehicle module, selling it on Amazon.com and its website. The device plugs into the on-board diagnostics port of any car made in 1996 or later. Its embedded 3G radio links that car to the cloud, where it uploads hundreds of different data points about the car every minute, tracking every tap of the brakes and every start of the ignition. There are a lot of these plug-in modules on the market, designed by companies like Automatic, Zubie, MetroMile and Dash, but Mojio is setting itself apart by turning itself into a development platform and an app store. While other module makers have APIs and work with developers, Mojio intends to make third-party apps its primary business model in hopes of attracting not just consumers but also businesses that want customized telematics services. “We wanted to empower the software community to bring about the connected car revolution instead of trying to do it ourselves,” Mojio co-founder and CEO Jay Giraud told me. At launch, Mojio has seven apps in its stable. [company]Concur[/company] will tap into Mojio’s daily driving data to automatically track your mileage. 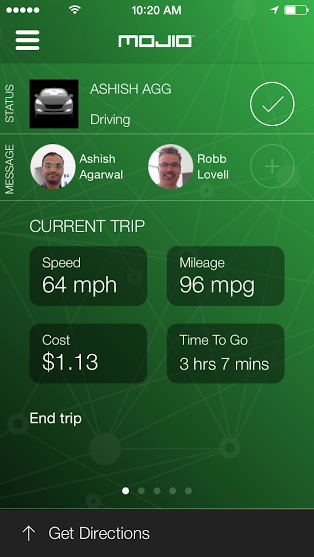 Glympse will use Mojio’s embedded GPS to let you keep constant tabs on your car, even when you’re not in it. IFTTT is linking the car to the larger world of the internet of things. FleetLeed is is plugging Mojio into its vehicle tracking and telematics network. The other partners are Kiip Rewards and GoodCoins. While some of these partners will offer their services through Mojio’s own Android and iOS smartphone app, many of them will use Mojio’s cloud data to make their own apps smarter. According to Giraud, Mojio is now working with more than 100 other companies and will announce new partners as they launch on its network. It’s talking to auto insurers, driver safety app designers, parking reservation companies and numerous location-based services startups, Giraud said. Right now the module is a “read-only” device, meaning it can tap into the wealth of data in your car’s control access network, but eventually Mojio plans to turn on “write” capabilities, which will give developers direct access to telematics features like remote door unlock. The Mojio module costs $149 in the U.S. and $169 in Canada, and comes with a year of service. After that, Mojio plans to charge a $5 month subscription fee. Eventually, Mojio plans to whittle down that monthly cost, and may even make the service free, Giraud said. The module only transmits about 1 MB of data a month over AT&T and Telus’s networks, so consumers are really paying for a persistent connection, not a data plan. As Mojio sells more devices, it hopes its connectivity costs will drop, and as it attracts more developers Mojio plans to make its money through API calls to its cloud data, which in turn will let it subsidize its remaining mobile data fees. Who owns the data generated by your car? Can they sell it to third parties, insurance companies,etc.? I wouldn’t say one is better or worse, Josh (I use Automatic as well), but they do take different approaches to their service. Automatic develops its services internally, while partnering with specific companies like Ford and IFTTT. Mojio aims to be more of an Android for the plug-in car module, opening up to any developer willing to pay to access its API. You could look at this way: If you want to use a driver safety rating app on Automatic, you’ll wind up using the app developed by Automatic. On Mojio you might wind up getting a choice between multiple third-party driving apps. Of course, Mojio still has a ways to go before it builds up a big developer community, and I suspect we’re going to see Automatic and many of the other module makers go in a similar direction in the future.